Take the pressure out of Christmas preparations by heading to Farnham’s Christmas Market on Sunday 9 December (10am to 4pm) in the town centre. 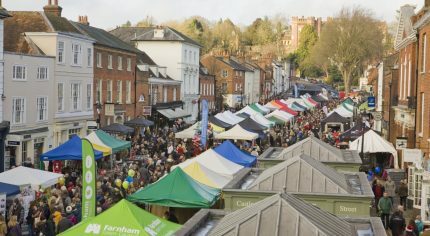 There will be around 200 stalls where shoppers will find gifts galore, Christmas decorations and food and drink treats. Father Christmas will be in his grotto ready to meet children and the nativity scene will be recreated, featuring live animals which children can meet. Live performances from local choirs and bands will also add to the festive spirit. The shuttle bus will run on the hour and half hour from the Hale Institute, calling at Tesco Express Upper Hale and Farnham Park. A further service will run on the hour and half hour from Weydon School where visitors can park in the school’s car park. The bus will stop at the train station and the bus stop at The Chantrys/West Street Cemetery. Both services start at 9.30am and run throughout the duration of the market. The last bus will leave the market at 4.30pm. Clothes and accessories, home and gardenware, kitchenware, gift experiences, jewellery, and food and drink gifts are among some of the items Christmas shoppers will find. Wreaths, Christmas cards, table and tree decorations will also be available and, shoppers needing a pick-me-up can enjoy traditional Christmas treats such as mulled wine and mince pies or modern street food inspired by international cuisine and local ingredients. As well as The Black Spot Removal Company, shoppers will be able to meet gold sponsors and local businesses Kidd Rapinet, Abbeyfield Wey Valley Society and Wiltshire and Sons. The Duke of Cambridge pub and Bloom Restaurant have also provided sponsorship to help put on the market. Whilst in town, shoppers will be able to visit a wide range of national and independent shops in Downing Street, West Street, the Lion and Lamb yard and Cambridge Place. See the full list of market stallholders.